Newington, Connecticut’s come a long way from its earliest days when it was referred to as both “Pipestave Swamp” and “Cow Plain.” Since 1871, the “new town in the meadow” has been known for its quaint colonial feel and family-focused atmosphere. Modern day Newington offers residents a local community steeped in local tradition and history. Proud to be part of the Newington community, Mattress For LESS, at 2585 Berlin Turnpike, strives to provide residents of the area the best mattresses at truly affordable prices. Where the town of Newington has changed and evolved, the need for a good night’s sleep continues to be as important today as it was 150 years ago—maybe even more so considering the stresses modern day society places upon us. After a full day of work and family obligations, a proper night’s sleep on a quality mattress rejuvenates and heals in ways that only sleep can. 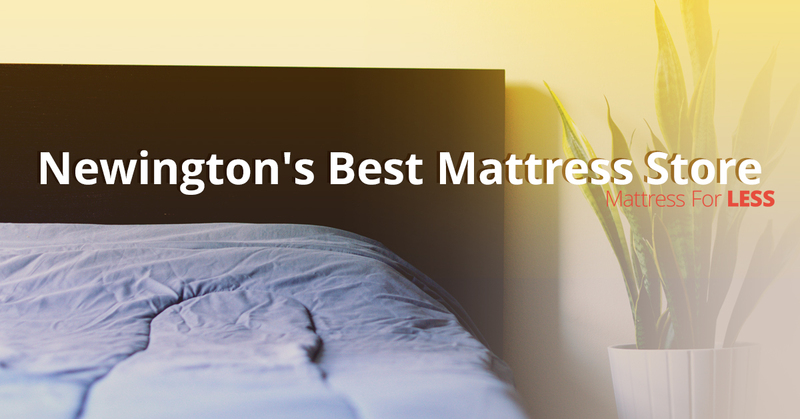 We at Mattress For LESS want to help the citizens of Newington get a good night’s sleep each and every night. At Mattress For LESS, our entire focus has always been keenly aimed at providing the best mattresses, bed frames, and headboards that deliver that restful night’s sleep. Carrying only the very best mattresses from the most popular and respected brands, Mattress For LESS stands behind its products and every purchase. We are a Top Rated Local® store offering the highest quality and most affordable bedding. Bedding products we offer include mattresses, protective bedding, headboards, and more. We offer mattresses from top brands such as Sealy Posturepedic, Sealy, Therapedic, Eclipse, Kingsdown, Solstice, Body Fit, AmeriMattress, Easman House, Leggett & Platt and more. We also provide quality hand-tufted mattresses from Eastman House’s Traditional Collection. We sell mattresses in traditional sizes as well as Full XL (special order) and Twin XL. Click below to learn more. Not only can adjustable base beds offer relief from medical ailments, but they can also aid in reducing snoring, more comfortably watching TV, and giving you and your partner the comfort you both need. In addition to our high-quality affordable mattresses, we offer headboards, bed frames, mattress protectors, pillows, and more so you can get a bed that meets your needs and helps you get the sleep you need. We offer no money down and zero percent financing as well as other payment options when needed. No credit is necessary to purchase a quality mattress from Mattress For LESS and we provide same day delivery! We believe that everyone should have a mattress that helps them sleep through the night, have pleasant dreams, and wake up feeling rested and energized for their day. Visit us at our location in Newington to experience the Mattress For LESS difference and sleep well tonight and every night after. Click below to shop online or visit our Newington store!